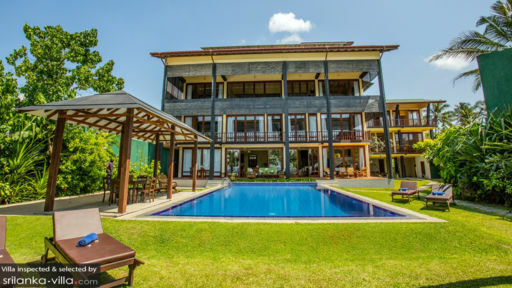 Located at the point where two bays meet on the golden sandy beaches of Koggala, just a few kilometers away from the more touristic Galle town, Villa South Point is a spacious and newly renovated villa which is perfect for a holiday with the family or friends. Villa South Point boasts of eight bedrooms with 2 bedrooms on the ground floor and 4 on the first floor and 2 on the second floor. The luxurious four poster beds with antique colonial furnishings create an aura of comfort and peace for its guests. Just beyond the veranda is a large 20 x 40 foot pool which overlooks the ocean, where you can easily imagine yourself relaxing with a cold drink watching the sun set over the horizon. The landscaped and perfectly manicured garden slowly blends itself into the beach just in front. The three story Villa South Point has two sitting rooms on the first floor and the second floor with comfortable sofas and tastefully decorated spaces and even air conditioning at the second floor living room. On the ground floor, there is also a veranda spanning the length of the building having a spectacular view of the garden and the ocean beyond that. Fully staffed with a laundry service, a dedicated chef, free WiFi, satellite TV, and free transport, Villa South Point is ready and waiting to provide its guests with a perfect holiday experience. 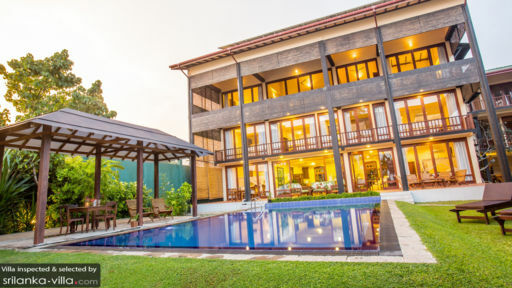 Just a 15 minute drive from the historic World Heritage Site of Galle fort, Villa South Point provides the ideal location for a beach getaway with easy access to many sight-seeing opportunities for guests of all ages including the a sea-turtle hatchery in Koggala, boat rides on the Koggala lagoon and snorkeling in the Unawatuna bay all just a few kilometers away. We have just spent a wonderful week at this stunning villa with our family. The staff were attentive and unobtrusive providing us with an immaculate and comfortable stay. Nothing was too much trouble and they kept the Villa immaculate and made us feel were welcome and pampered. The Sri Lankan food was delicious and the chef was excellent, happy to suggest and cooked us some amazing fish, curries and a wonderful bbq. We all enjoyed the egg hoppers and dahl and were happy to listen to his suggestions. Some of our party enjoyed learning how to cook some of the curries in his kitchen. 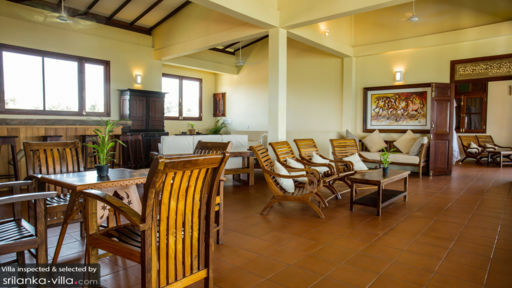 The Villa is in a good location to Galle and nearby beaches and restaurants. We enjoyed massages and yoga classes near the beach. All the amenities including rooms and staff were great - couldn't help us enough! We were able to just relax and enjoy ourselves while everything was taken care of. Perfect location for a big family reunion! We had the most memorable family holiday in Srilanka. We were a family of 19 people and were most comfortably accommodated in South Point and Ocean Villa. The rooms are very well appointed and all the seven rooms in South Point Ocean face the pool and the sea. The staff is very polite and extremely helpful. The food was very good the chef and his team did an excellent job, making sure everyone's preferences were catered too. The tables were beautifully laid, and one evening they served us dinner on the lawn. There is a natural cove and a beach there which makes it very private and lovely. An early morning walk along the beach and a swim before breakfast is great. The management also arranges cars and vans for trips to Galle or the places of interest nearby. All in all its a great holiday place.